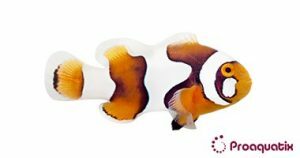 An orange-colored clownfish with three white stripes. Black margins are found on the edges of all fins and the borders of the white stripes. The Cheekspot Percula will have a mark on the face that is disconnected from the first stripe and may appear on one or both cheeks.